The weather had changed, and a hot sun baked the mud dry into the street near where just about two dozen families set out their damaged belongings to be picked up by the trash. A large dumpster brought to the street by the City of Bellevue is overflowing. So is the outpour of support. 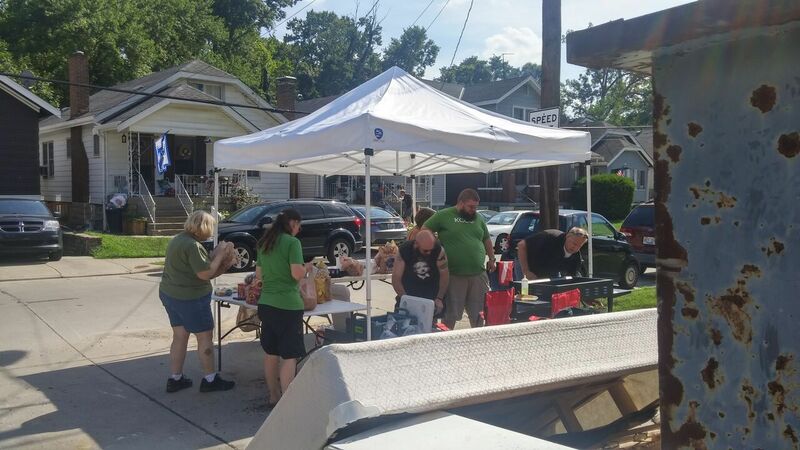 A white tent also popped up curbside on Covert Run and underneath, local business people fired up a grill, and served hot dogs, burgers, pizza, and sweet treats to the families who have spent the past four days cleaning up a muddy mess. "It's something we needed to do to give back," said Larry Brondhaver, an owner of Avenue Brew, the popular coffee shop on Fairfield Avenue in Bellevue's shopping district. 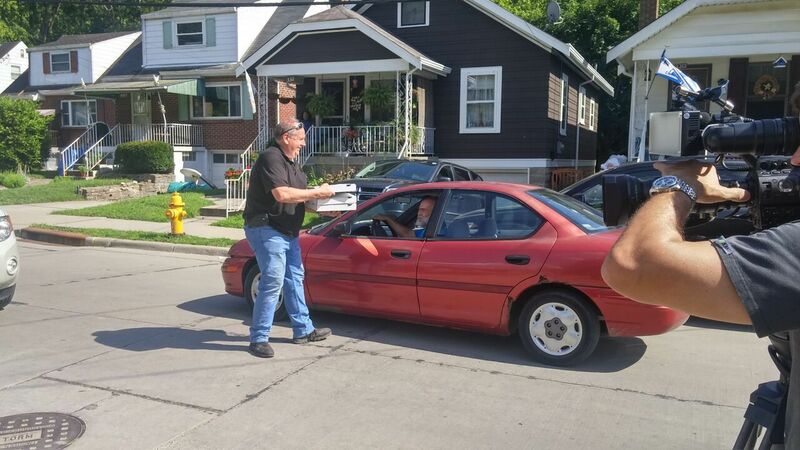 He got the idea late Saturday afternoon, made the rounds to other surrounding businesses, and was able to raise around $300 in a flash. More than twenty businesses pitched in, and Lowe's sold a grill to Brondhaver with a steep discount, he said. "People come and shop at our stores, so we figured we'd give back to them." Jerry Wiegand walked over to the pop-up cookout, covered head to toe in dirt from all the clean-up work at his home, which was damaged, he said, when the nearby creek was overwhelmed by the intense downpour early Thursday morning. "It's messy and muddy," Wiegand said. "It's a slow cleaning process. We've been throwing a lot of stuff away." Wiegand said he was grateful for the businesses' support but also said, pointing to the overflow behind the cookout, that he hoped the city would bring another dumpster. "Hopefully the city will do something about that creek." 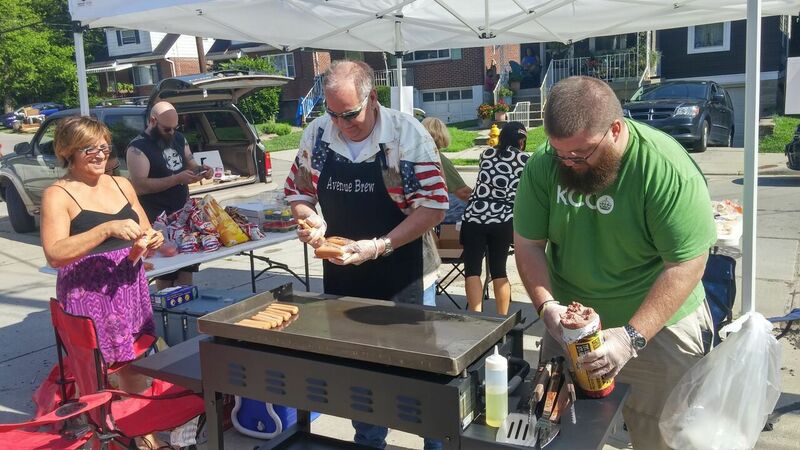 The spirit of togetherness in Bellevue was on display Sunday between the businesses and residents, and between the neighbors. "Some people got hit worse than others," he said of his street, still lined with piles of what is now trash in front of people's homes. "We try to help each other out as much as we can." The City of Bellevue will also be helping and stated last week that the dumpster on Covert Run would be replaced as needed over the course of the coming week. The city also said that all waste hauled by residents who are able to the city's transfer station (630 Colfax Ave.) on Monday from 11:30 a.m. to 3 p.m. will be free of fees. For larger items or things that can't be hauled, residents should place the pile in front of their home and call 859.431.8888 to notify the city which will send crews to pick it up this coming week. Businesses that participated in Sunday's cookout on Covert Run were Avenue Brew, Siam Orchid, Ball Embroidery, Witt's Candy Emporium, Cozy Cottage, Irish Leather Works, Bella on the Avenue, Frame and Hang Studio Gallery, Twisted Sisters, New Look, Jo Ann Hair Salon, Schneider's Sweet Shop, Torn Light Records, Interior Visions, Purple Monkey/LaSorelle, Splending Things, Mama C's, Darkness Brewing, and Kroger.